The death toll from Saturday's truck bombing in Somalia's capital is now over 300, the director of an ambulance service said Monday, as the country reeled from the deadliest single attack it's ever experienced. The death toll has steadily risen since Saturday, when the blasts - for which no organisation had claimed responsibility by Monday morning - struck at two busy junctions in the heart of the city. “We have confirmed 300 people died in the blast. The death toll will still be higher because some people are still missing,” Abdikadir Abdirahman, the director of the city’s ambulance service, told Reuters on Monday. Nur said 160 of the bodies could not be recognised. “(They) were buried by the government yesterday. The others were buried by their relatives. Over a hundred injured were also brought here,” he told Reuters at the hospital. “My last time to speak with my brother was some minutes before the blast occurred. By then he told me, he was on the way to meet and was passing at K5,” Halima Nur, a local mother, told Reuters, referring to one of the junctions that was struck. 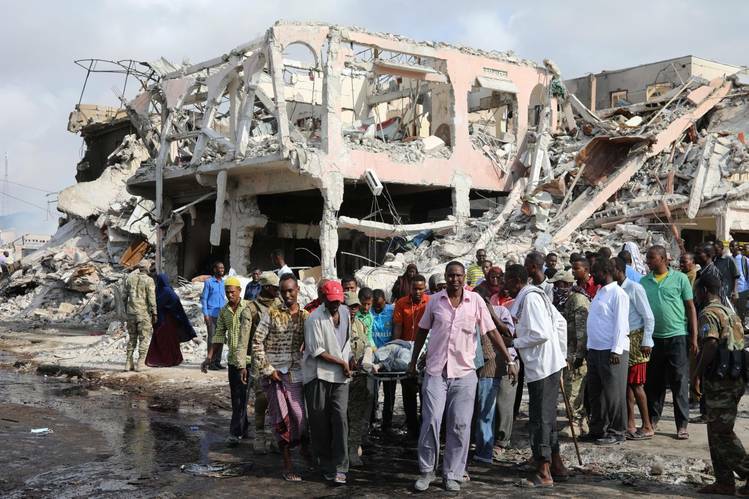 Saturday bomb attacks were the deadliest since Islamist militant group al Shabaab began an insurgency in 2007. Neither it nor any other group had claimed responsibility, but al Shabaab, which is allied to al Qaeda, stages regular attacks in the capital and other parts of the country. The group is waging an insurgency against Somalia’s UN-backed government and its African Union allies in a bid to impose its own strict interpretation of Islam. The militants were driven out of Mogadishu in 2011 and have been steadily losing territory since then to the combined forces of AU peacekeepers and Somali security forces. But al Shabaab retains the capacity to mount large, complex bomb attacks. Over the past three years, the number of civilians killed by insurgent bombings has steadily climbed as al Shabaab increases the size of its bombs. Some of those seriously injured in Saturday’s bombing were moved by ambulance to the airport on Monday morning to be flown to Turkey for further treatment, Nur added. Workers unloaded boxes of medicine and other medical supplies from a Turkish military plane parked on the tarmac, while Turkish medical teams attended to the cases of injuries moved from the hospital for evacuation. The Eiffel Tower will go dark Monday night in honour of the victims of the truck bombing, Paris Mayor Anne Hidalgo announced on Twitter. “We will turn the Eiffel Tower’s lights off at midnight in homage to the victims of the attack that took place in Mogadishu,” she wrote, using the hashtags #NousSommesUnis (“We Are United”) and #Paris.